Note- After my visit, Mamma Lina’s closed because Chick retired. It saddens me when old time businesses close and time marches on, but it’s still a story worth sharing. I’m not sure which I loved more, meeting Mamma Lina’s 92 year old owner Checchino or eating my meatball sandwich and watching pasta being made! 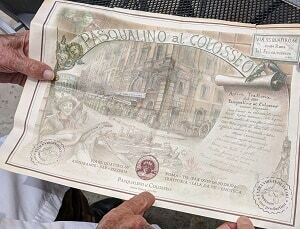 Chick is his nickname and he showed me a placemat from the restaurant where he baked bread at age 9 in Rome. He told me how he came to the US after the war and he and his wife Michelina worked very hard to grow their Italian food business. 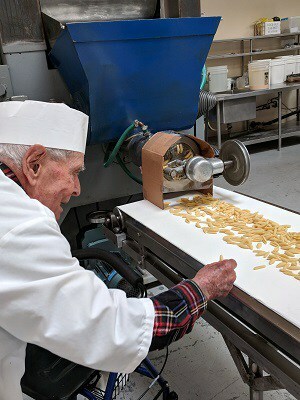 After years of being located on El Cajon Blvd, they moved to a bigger factory in Sorrento Valley and make enough pasta to supply many of the restaurants. Chick still oversees the production and has a keen sense of making the pasta to high standards. Thank you Massullosought family for serving us wonderful pasta all these years.